The crucial meeting of some ECOWAS leaders on the political crises in The Gambia has ended in Abuja with a resolve to ensure that the will of the people as expressed through the ballot box is respected in conformity with the Gambian constitution. 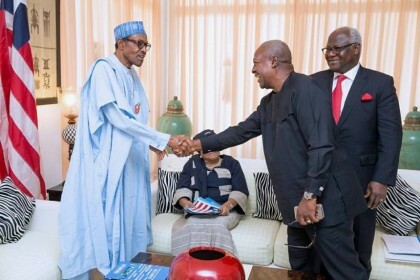 The meeting at the instance of President Muhammadu Buhari as ECOWAS mediator on the crises was attended by ECOWAS Chairperson and President of Liberia Ellen Johnson Sirleaf, Senegalese leader Macky Sall and former President of Ghana John Dramani Mahama. Minister of Foreign Affairs Geoffrey Onyeama briefed journalists at the end of the meeting which expressed concern over the deteriorating security situation in the country and shared views on the way forward. It could be recalled that the Gambia president Yahaya Jammeh first concedes defeat after he was defeated by his major rival Adama Barrow and later reneged his position. Jammeh has insisted that he will not step down when his tenure ended January 19th, 2017. However, West African leaders have resolved to ensure a peaceful resolution of the political logjam in Gambia.